An unique Lake District hotel/pub located in the magnificent setting of the Great Langdale Valley, in the midst of some of the highest mountains in England. With twelve en-suite rooms, everyone different, yet retaining original features of antique and vintage décor. A choice of places to eat and drink include the comfortable and peaceful residents' lounge with an open log fire, the dining room serving good home-cooked food, within a friendly atmosphere and the homely Hiker's Bar, where a selection of real ales provides a just reward after a long ride, which always has a friendly, lively spirit about the place, often with live entertainment, in the form of occasional open music nights where anyone can get up and play! So wake up to stunning Lake district panorama, stay in a 300 year old inn and enjoy genuine hospitality from owners Neil and Jane who have run this lovely hotel in a traditional way for the last 23 years. Large parking area and garaged by arrangement. 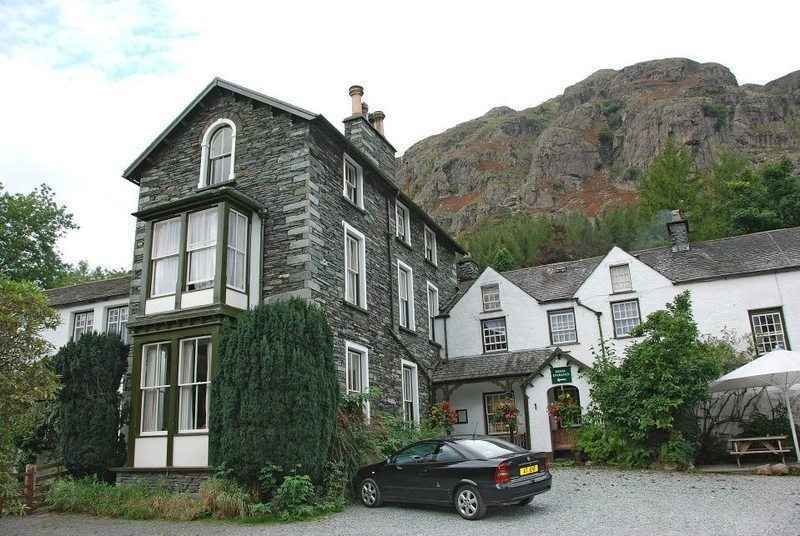 The Old Dungeon Ghyll Hotel, Great Langdale, Ambleside, Cumbria, LA22 9JY. As above. Local attractions close by are Wastwater (Britains favourite view), Scarfell Pike, Eskdale Valley, Devoke Water, Muncaster Castle, Eskmeals Nature Reserve, Lal Ratty (Ravenglass and Eskdale railway) and the rest of Cumbria for your relaxing break.romantic wedding village of Gretna Green, the historic city of Carlisle and Hadrian's Wall and just a short ride from the English Lake District, the Kielder Forest Region, Scotland's Solway Coast and the scenic Border Region. Tebay Village, touring the The Lakes and the Yorkshire Dales, in the midst of some of the most beautiful scenery in the country. The village is surrounded by the beautiful Howgill Fells, in the Lune Valley within the Yorkshire Dales National Park. An easy ride to the historic market town of Penrith, Hawes, Kendal and Kirkby Stephen and less than 2 hours to The Scottish Borders, Hadrian's Wall and/or Barrow-in-Furness.